The Convert Harness is the most versatile Dog Harness on the market and you can take this harness anywhere. Just clip it on and you and your furry companion are good to go. This dog harness has been built to last. Super durable, strong and also soft on your dog. If your dog loves the outdoors and does not want to be limited in anyway, then this is the perfect solution. Because the load is distributed across the dog's chest and around the sides, it does not pull against the throat like a standard collar does. Durable materials and innovative construction helps to ensure a safe and secure fit. Like all our harnesses, it is finished with a stainless steel D-ring that will not rust and features a soft-touch, magnetic traffic handle for when you need close control of your dog. The Saddle Bags attach to the either side of the Convert Harness to quickly and easily turn it into a Backpack. When you want it back as a harness, simply detach the Saddle Bags. Make sure your dog is visible on those night time walks. 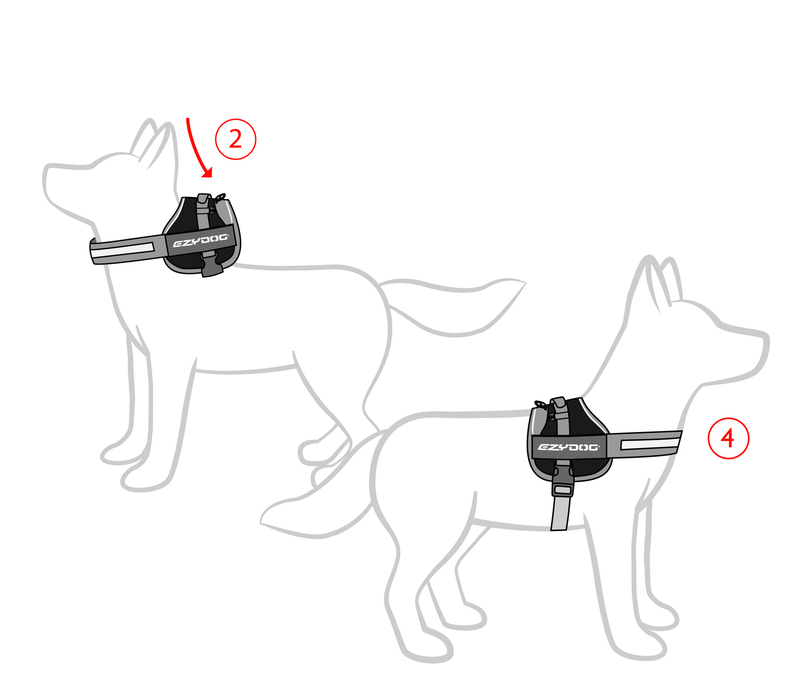 This dog light is just as strong and durable as the Convert Harness itself. "i love these harnesses. one one for each dog now. very strong. one even protected my smaller dog from a bite from a strange dog. accessories are great for the harness also." "This harness looks fantastic on my dog even though I haven't had a chance to take her walking in it due to having a broken arm. It is extremely well made like all the previous Ezydog products I have purchased. Highly recommended. " "Our boys is extremely comfortable and secure in this harness awesome product. " "This is a second harness. The first was for our Rhodesian Ridgeback purchased about four years ago and has been trouble-free and easy to use. Now we have a new Harrier pup And got another harness for her. It has been wonderful to take her for walks and training her without the stress of choking her with a Typical collar and lead. The build quality of both harnesses is excellent and we highly recommend them." "I love this harness, my dog has no restrictions on her neck and is perfectly happy parading around in it. "We have a large AM staffie puppy very excitable and loves to jump when being walked. this harness has made life so much easier to walk and train him and secure him in the car safely we love this product." "Hiked with our two Ridgebacks complete with saddle bags. Excellent product, easy to adjust and great fit. Dogs took them instantly. Easy to take on and off when we stopped for lunch. Highly recommend "
"We have a 6 month old German Shepherd who gets distracted and can rip your arm out but this harness is strong and sturdy and with the handle gives you instant control. Has made walking so much more pleasurable. Highly recommend this product. " " I have two Bernese Mountain Dogs who both pull, with one weighing over 65kgs, I need more control over them. The harnesses were easy to adjust to the boys, are simple to put on them, look really good and give me more control. The pulling still happens but I shall put that down to the lads needing some more encouragement from Mum rather than the harnesses! I love the handle on the top of the harness, comfy and gives me more control in situations when I need the lads close to me. " "What a fantastic harness. Fits perfectly. its quick clips are strong and durable. The handle is strong and neat, great product and really fast delivery,"